Series LF008PCQT Lead Free Anti-Siphon, Spill-Resistant, Vacuum Breakers prevent the reverse flow of polluted water from entering into the potable water supply due to backsiphonage on indoor point-of-use applications. 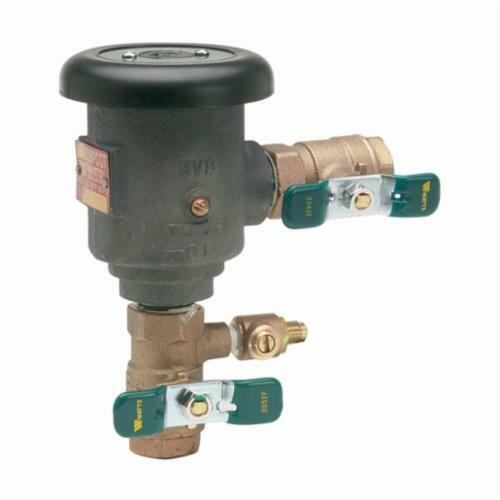 It consists of a Lead Free cast copper silicon alloy body construction, thermoplastic check and float assembly valve, stainless steel springs, tee handles, and a molded diaphragm separating the air inlet from the potable water supply to prevent spillage. Series LF008PCQT is ideal for indoor use on machines or equipment in general plumbing applications. Maximum Working Pressure: 150 psi (10.34 bar), Minimum Working Pressure: 8 psi (55.2 kPa).